In my column on Friday I reported the unreported facts in the payroll jobs report. If we choose to believe the report, it is really very bad news. Good middle class jobs are continuing to decline. The new jobs are jobs that pay considerably less and often are part-time jobs devoid of benefits. Moreover, the new jobs are going to people outside the prime working age. The unavoidable conclusion is that for the majority of Americans, economic prospects are declining. There is more bad news to be added to this dismal picture. The payroll jobs report provides both the actual numbers of jobs from the survey and the seasonally adjusted number. The news release is always the seasonally adjusted number, which is the number that my column examines. However, the seasonally adjusted number is concocted. In past reports I have explained that the Bureau of Labor Statistics (BLS) has a birth-death model that assumes new unreported jobs from new business startups exceed unreported jobs losses from business failures. John Williams (shadowstats.com) has shown that over-estimates from this model can add 750,000 non-existant jobs to the reported annual payroll jobs increase. Seasonal adjustments can have the same effect. For example, the actual reported gain in new payroll jobs prior to seasonal adjustments was only 11,000. The seasonally adjusted gain was 292,000. In other words, seasonal adjustments accounted for 281,000 of the 292,000 reported jobs. There is a case for making seasonal adjustments, but not when seasonal adjustments account for 96% of the jobs gain. Probably what we are observing is that the economic house of cards that the Federal Reserve has constructed together with financial deregulation depends heavily on reported jobs gains for its stability, and this stability is provided by the use of the birth-death model and seasonal adjustments to produce reassuring payroll jobs numbers. As I have pointed out in numerous columns, if the reported jobs claims were real, the labor force participation rate would not be declining. 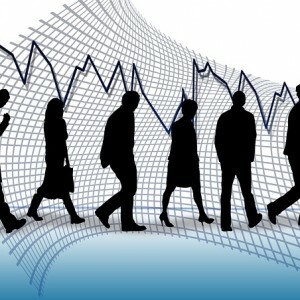 If the reported jobs claims were real, people would be entering the work force attracted by employment opportunities. They would not be leaving the work force from discouragement and frustration in finding employment. The Obama regime’s claim that the declining US labor force participation rate is the result of rising retirements is contradicted by the fact that the reported payroll jobs gains are primarily accounted for by the oldest age group, 55 and higher. I am left with the conclusion that the 281,000 jobs produced by seasonal adjustments are the product of the misuse of seasonal adjustments in order to keep alive the appearance of economic recovery. Keep in mind, also, that payroll jobs are the number of jobs, not the number of employed people. Many payroll jobs are part time with two or more being held by one person.